Fahrenheit 451 is a 1966 British Dystopian science fiction drama film directed by François Truffaut and starring Oskar Werner, Julie Christie, and Cyril Cusack. Based on the 1953 novel of the same name by Ray Bradbury, the film takes place in a controlled society in an oppressive future in which a fireman, whose duty it is to burn all literature, becomes a fugitive for reading. This was Truffaut's first colour film as well as his only English-language film. At the 1966 Venice Film Festival, Fahrenheit 451 was nominated for the Golden Lion. In the future, a totalitarian government employs a force known as Firemen to seek out and destroy all literature, permitting them to search anyone, anywhere, at any time. One of the Firemen, Guy Montag (Oskar Werner), meets one of his neighbors, Clarisse (Julie Christie), a 20-year-old schoolteacher whose job is hanging by a thread due to her unorthodox views. The two have a discussion about his job, where she asks if he ever reads the books he burns. Curious, he begins to hide books in his house and read them, starting with Charles Dickens' David Copperfield. This leads to conflict with his wife, Linda (also played by Julie Christie), who is more concerned with being popular enough to be a member of The Family, an interactive television program that refers to its viewers as cousins. At the house of a book collector, the captain (Cyril Cusack) talks with Montag at length about how books change people and make them want to be better than others, which is considered anti-social. The book collector, a middle-aged woman who was seen with Clarisse a few times during Montag's rides to and from work, refuses to leave her house, opting instead to burn herself and the house so she can die with her books. Returning home that day, Montag tries to tell Linda and her friends about the woman who martyred herself in the name of books and confronts them about knowing anything about what's going on in the world, calling them zombies and telling them they're just killing time instead of living life. Disturbed over Montag's behavior, Linda's friends try to leave but Montag stops them, by forcing them to sit and listen to a novel passage. During the reading, one of Linda's friends breaks down crying, aware of the feelings she repressed over the years, while Linda's other friends leave in disgust over Montag's alleged cruelty and the sick content of the novel. That night, Montag dreams of Clarisse as the book collector who killed herself. The same night, Clarisse's house is raided but she escapes through a trapdoor in the roof, thanks to her uncle. Montag breaks into the captain's office looking for information about the missing Clarisse and is caught but not punished. Montag meets with Clarisse and helps her break back into her house, to destroy papers that would bring the Firemen to others like her. She tells him of the "book people", a hidden sect of people who flout the law, each of whom have memorized a book to keep it alive. Later, Montag tells the captain he is resigning but is convinced to go on one more call, which turns out to be Montag's house. Linda leaves the house, telling Montag that she couldn't live with his book obsession and leaves him to be punished by the Firemen. Angrily, he destroys the bedroom and television before setting fire to the books. The captain lectures him about the books and pulls a last book from Montag's coat, for which Montag kills him. He escapes and finds the book people, where he views his "capture" on television, staged to keep the masses entertained and because the government doesn't want him alive. Montag selects a book to memorize, Tales of Mystery & Imagination by Edgar Allan Poe and becomes one of them. Yvonne Blake : Anti-semite and Jew by Jean-Paul Sartre, ill-translated in the movie from the original French title: "Réflexions sur la question juive". Truffaut kept a detailed diary during the production and later published in both French and English (in Cahiers du Cinema in English). In this diary, he called Fahrenheit 451 his "saddest and most difficult" film making experience, mainly because of intense conflicts between Werner and himself. The film was Universal Pictures' first European production. Julie Christie was originally cast as Linda Montag, not Linda and Clarisse. The part of Clarisse was offered to Jean Seberg and Jane Fonda. After much thought, Truffaut decided that the characters should not have a villain/hero relationship but rather be two sides of the same coin and cast Christie in both roles, although the idea came from the producer, Lewis M. Allen. In an interview from 1998, Charles Aznavour said he was Truffaut's first choice to play the role given to Werner; Aznavour said Jean-Paul Belmondo was the director's second choice but the producers refused, on the grounds that both of them were not familiar enough for the English speaking audience. Paul Newman, Peter O'Toole and Montgomery Clift were also considered for the role of Montag; Terence Stamp was cast but dropped out when he feared being overshadowed by Christie's dual roles in the film. Laurence Olivier, Michael Redgrave and Sterling Hayden were considered for the role of the Captain, before Cyril Cusack was cast. 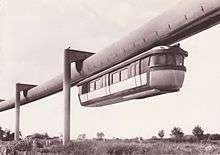 The film was shot at Pinewood Studios in England, with the monorail exterior scene taken at the French SAFEGE test track, in Châteauneuf-sur-Loire near Orléans, France (since dismantled). The film featured the Alton housing estate in Roehampton, south London and also Edgcumbe Park in Crowthorne, Berkshire. The final scene of the Book People was filmed in a rare and unexpected snowstorm that occurred on Julie Christie's birthday, April 14, 1966. The production work was done in French, as Truffaut spoke virtually no English but co-wrote the screenplay with Jean-Louis Richard. Truffaut expressed disappointment with the often stilted and unnatural English-language dialogue. He was much happier with the version that was dubbed into French. The movie's opening credits are spoken rather than displayed in type, which might be the director's hint of what life would be like in an illiterate culture. Tony Walton did costumes and production design, while Syd Cain did art direction. In 1971, some scenes from Fahrenheit 451 were used in The Different Ones, an episode of Rod Serling's Night Gallery television show, including the monorail and the flying policeman. In the film, Montag gets the book Tales of Mystery and Imagination by Edgar Allan Poe. In the novel, he gets the Book of Ecclesiastes. Other notable differences with the original text are that the film adaptation dropped almost all science fiction elements present in the book (professor Faber and his portable communicator, the Mechanical Hound, the book people's methods of recalling texts from memory without learning them by heart). The film also does not show the war and destruction that break out as Montag flees the city, though, in the scene where Montag calls out Linda's friends on their ignorance of the world, there is mention of a war that the government is keeping from the public by disguising it as field training for men who have been drafted. Most important is the character of Clarisse McClellan. In the novel, Clarisse is a 16-year-old girl, who dropped out of high school to escape its anti-intellectual tedium and is killed by a speeding car in a hit and run. In the movie, Clarisse is a 20-year-old woman who worked as an elementary school teacher but was fired for her unorthodox teaching methods (while other teachers make the students recite their times tables, Clarisse actually engages her students in discussing subjects, an act considered hideously anti-social) and is almost caught by the Firemen (who have her and her uncle under investigation for their subversive behavior) but ends up escaping society, reuniting with Montag when he flees the city and living among the Book People. 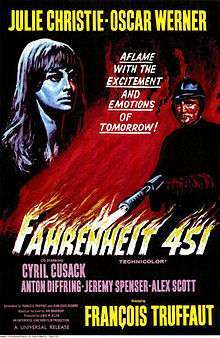 Ray Bradbury was pleased with Truffaut's decision, preferring the "Clarisse stays alive" ending so much that he adapted it for his stage production of Fahrenheit 451. The film had a mixed critical reception upon release. Time magazine called the film a "weirdly gay little picture that assails with both horror and humor all forms of tyranny over the mind of man"; it "strongly supports the widely held suspicion that Julie Christie cannot actually act. Though she plays two women of diametrically divergent dispositions, they seem in her portrayal to differ only in their hairdos." They also noted that the film's "somewhat remote theme challenged [Truffaut's] technical competence more than his heart; the finished film displays the artisan more than the artist." Bosley Crowther called the film a "pretentious and pedantic production" based on "an idea that called for slashing satire of a sort beyond [Truffaut's] grasp, and with language he couldn't fashion into lively and witty dialogue. The consequence is a dull picture—dully fashioned and dully played—which is rendered all the more sullen by the dazzling color in which it is photographed." The film was nominated for a 1967 Hugo Award in the Best Dramatic Presentation category, along with Fantastic Voyage and 3 episodes of Star Trek. It lost out to the Star Trek episode The Menagerie. Martin Scorsese has called the film an underrated picture which had influenced his own films. Leslie Halliwell described it as 1984 stuff, a little lacking on plot and rather tentatively directed, but with charming moments. It has gained significant critical acclaim over the years. On the review aggregator web site Rotten Tomatoes, the film holds an 81% positive rating among top film critics based on 32 reviews, and a 72% positive audience rating based on 25,472 user ratings. Author Ray Bradbury said in later interviews that despite its flaws, he was pleased with the film. He was particularly fond of the film's climax, where the Book People walk through a snowy countryside, reciting the poetry and prose they've memorized, set to Herrmann's melodious score. He found it especially poignant and moving. In a 2009 interview Bradbury was quoted, "The mistake they made with the first one was to cast Julie Christie as both the revolutionary and the bored wife." According to an introduction by Ray Bradbury, to a CD of a rerecording of the film score by William Stromberg conducting the Moscow Symphony Orchestra, Bradbury had suggested Bernard Herrmann to Truffaut. Bradbury had visited the set of Torn Curtain, meeting Alfred Hitchcock and Herrmann. When Truffaut contacted Bradbury for a conference about his book, Bradbury recommended Herrmann, as Bradbury knew Truffaut had written a detailed book about Hitchcock. When Herrmann asked Truffaut why he was chosen over modern composers, such as the director's friends Pierre Boulez or Karlheinz Stockhausen, the director replied that "They'll give me music of the twentieth century but you'll give me music of the twenty first!" Herrmann used a score of only string instruments, harp, xylophone, vibraphone, marimba and glockenspiel. As with Torn Curtain, Herrmann refused the studio's request to do a title song. ↑ "Big Rental Films of 1967", Variety, January 3, 1968 p 25. Please note these figures refer to rentals accruing to the distributors. 1 2 "Out of Nothinkness". Time. November 18, 1966. Retrieved August 22, 2010. ↑ "Awards for Fahrenheit 451". Internet Movie Database. Retrieved May 17, 2012. ↑ Insdorf 1995, p. 187. ↑ Baecque 1999, p. 212. ↑ François Truffaut (Director) (2003). Fahrenheit 451 Special Features (DVD). Universal Pictures. ↑ "Charles Aznavour". Time. July 9, 1998. Retrieved February 26, 2009. ↑ Baecque 1999, p. 216. ↑ Julie Christie (Actress) (2003). Fahrenheit 451 Commentary (DVD). Universal Pictures. ↑ Crowther, Bosley (November 15, 1966). "Fahrenheit 451 Makes Burning Issue Dull". The New York Times. Retrieved February 26, 2009. ↑ "1967 Hugo Awards". The Hugo Awards. Retrieved May 18, 2012. ↑ Scorsese, Martin (November 13, 2006). "François Truffaut". Time. Retrieved February 26, 2009. ↑ Halliwell, Leslie (1997). John Walker, ed. Halliwell's Film and Video Guide. New York: Harper Collins. p. 246. ISBN 0-00-638779-9. ↑ "Fahrenheit 451". Rotten Tomatoes. Retrieved September 6, 2015. ↑ Bradbury, Ray. Bernard Herrmann and Fahrenheit 451. Liner Notes for CD, 2007. ↑ Kogehehn, Gunther. Fahrenheit 451. Liner Notes for CD, 2007. Bergan, Ronald, ed. (2008). François Truffaut: Interviews. Oxford: University Press of Mississippi. ISBN 978-1934110133. Bradbury, Ray (2003). Fahrenheit 451. New York: Simon & Schuster. ISBN 978-0743247221. Holmes, Diana; Ingram, Robert, eds. (1998). François Truffaut (French Film Directors). Manchester: Manchester University Press. ISBN 978-0719045530. Insdorf, Annette (1995). François Truffaut. New York: Cambridge University Press. ISBN 978-0521478083.